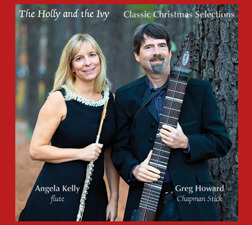 Flutist Angela Kelly joins me for a musical holiday treat that combines classical and jazz influences. The "Holly and the Ivy" is a uniquely accessible new take on thirteen classic Christmas favorites..
We recorded The Holly and the Ivy at my home studio in October and November of 2017. Angela plays flute, alto flute and bass flute on the record, and I used my wenge Grand Stick.